Before they learned to levitate, Dr Who’s mortal enemies, the Daleks, were stuck to the ground. Stairs stopped them in their tracks. They could yell “Exterminate” and point their pointy thing at you and blast you out of existence – but if you got up a few steps you’d be safe as a sandbag. My friend Jackie has the same problem. 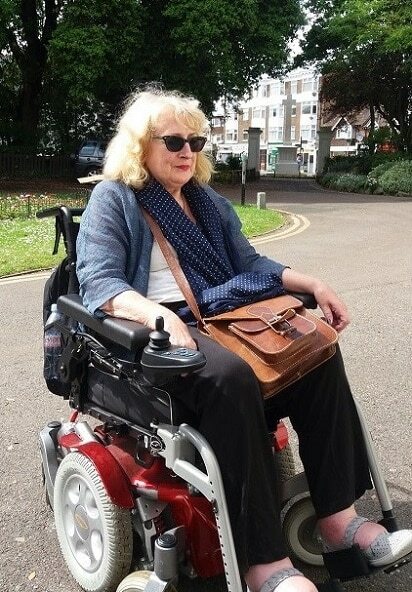 Like the Daleks, she uses a powered wheelchair and steps of any kind are a nightmare. Our new campaign group, Access Thanet, has recently done a survey of Broadstairs High Street, checking on wheelchair access. Some shops have ramps and some have flat entrances and some have impossible steps. And the most impossible are at Pierremont Hall. 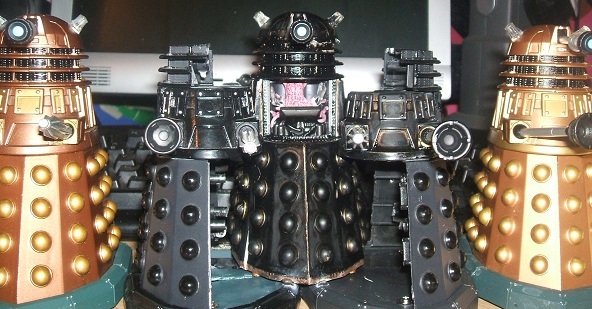 So Jackie can’t easily go and watch the enormously entertaining Broadstairs Town Council at work – where yelling “EXTERMINATE” might actually have its best effect…. But what’s more important is that it’s the place where Jackie has to vote. Five steep steps and no other way in. And, for stick-users like me, there’s no proper handrail. Pierremont Hall is a listed building so many people think that they’re exempt from making any concessions to access. Not quite true – they’re supposed to make “reasonable adjustments” to allow easier access for people with mobility problems. But enforcing that is almost impossible. A ramp can solve it. 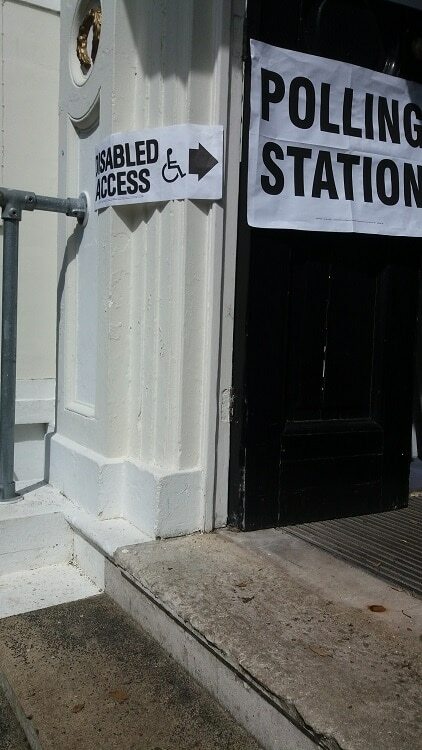 There’s one in Pierremont and Jackie had to use it for the last General Election. But it was very flimsy and insecure, and the authorities promised to do something about it next time. 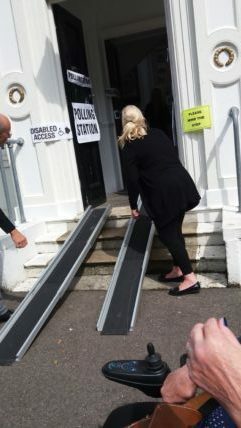 The next time is the referendum vote and up rolls Jackie to the steps. There’s a wheelchair sign and an arrow on the doorway. How helpful. But no ramp. I go in and ask what she’s to do. Panic on all sides. Out comes some helpful official. “I could take your ballot in for you” he says. No way says Jackie. So out comes the ramp – or rather ramps, as it’s in two parts. As solid as putting two planks up on the steps – and two short planks, thick as, is what springs to mind for the guy who designed it. In the end Jackie’s husband, a practical chap, showed the bureaucrats what to do and the ramp was placed on the steps – unfortunately upside down. More delays while frustrated voters tried to climb past it and came out even more bad-tempered when they found it was still there. I was going to suggest the EXTERMINATE option to Jackie until I remembered she had no useful pointy thing about her person. Eventually she gets in and triumph! – the ballot box is now lower than last time so she can put her vote in personally. But coming out was much, much worse. The top of the ramp fell apart leaving her balanced precariously, held up by two people, and looking very scared. Five people again put it back together and Jackie descended – too fast but in one piece. The electoral services officer phones us later to apologise and ask what would help. But so far the office has not answered my email asking what the provision was this year. I’m definitely getting Jackie a pointy thing for her next voting visit.